Being late is rarely about just being late. Oftentimes, it’s related to fear of downtime and/or a lack of time management skills. We’re all given the same 24 hours in a day. Yet some of us have that polished capacity to arrive with enough time before morning meetings to brew a fresh coffee. While others’ scrambled entrance is flustered and chaotic. The problem: You have a million things that came up last minute, all of which you know you need to complete by tomorrow. You also have a dinner party after work that your significant other begged you not to be late for (again). The solution: Take advantage of some free time in the evening before, and jot down a to-do list. Work for 25 minutes, known as one “pomodoro.” Rest for five minutes. After you finish four pomodori, take a longer break to recharge. You can alter the time according to your own personal attention span. Test the technique out on yourself with Moosti. These small but powerful swaps will hold you accountable to yourself, and keep your personal timing in check. Remember what we said about the overlap between optimism and chronic tardiness? Here’s where it’s helpful to keep that idealism in check: Elite Daily notes that people who are optimistic are often late because they believe they can do more things with the time they have. Let’s say Tom Tardy has 45 minutes for his 40-minute commute. As an optimist, he truly believes those extra five minutes can be used to pop into his favorite coffee shop. And while we don’t want to rain on Tom’s parade – there’s plenty of upsides to being an optimist, like a significantly high health score – there are some tweaks he can make to be more attentive. He could take into account that the coffee shop might have a longer line than usual, for example. Or that traffic is heavy today. Or that he’s running low on gas. And given that he’s on a time crunch, Tom would be better off without trying to squeeze any extra tasks in. By leaving early enough to “plan for trouble,” Tom staves off any potential issues that could stand in between him and arriving on time. What do Anna Wintor, Oprah, and the German public transportation system have in common? They all have a routine they stick to, which allows them to always be on time. Getting into the swing of a routine that works for your lifestyle will allow for structure that fosters punctuality. Clutter hurts your productivity. So, declutter your entryway. Then designate a spot by the door to hold all your daily must-haves like keys, your wallet, a backup umbrella, and reading materials for the commute. You can grab stuff without wasting any time searching, or making sure you have everything. That extra 30 seconds could be the difference between missing and making your train. Set all your clocks ahead by different times. It’s the age-old procrastinator trick, with a twist. Set your oven’s clock five minutes ahead, your microwave three, your living room clock seven, etc. You’ll trick yourself into leaving on time, since you won’t be certain which clock actually has the right time. 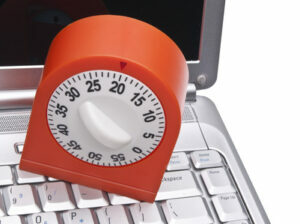 Use a special alarm so you never miss a morning meeting again. You can use an alarm that tracks your sleep and wakes you up when you’re in your sleep cycle’s prime. Or use “the world’s most annoying alarm app” that won’t stop ringing until you’ve taken a photo … outside of your bedroom. Schedule built-in overflow time. Just as you should give yourself plenty of time to arrive somewhere, schedule plenty of time on your calendar for tasks. This simple tweak just might be your superpower secret to solving any mid-morning crises that threaten to overtake your day. Like your monthly expense report that was due yesterday. Life Made Simple would like to thank MakeSpace for this excellent guest blog post. I will definitely be taking some of these tips to heart! Check out the MakeSpace website for a simple and innovative way to move and store your furniture and other items. Maybe you’ve wondered if the fancy stand-up desk your company purchased for your colleague is a waste of money and just the latest “shiny object.” Or perhaps you’ve considered one for your own office but aren’t really sure if the claims of increased health and productivity are true. A recent study from Texas A&M University found that employees who used sit-stand desks were 46% more productive than those at traditional desks. In addition, numerous research studies show that too much sitting can cause a decrease in overall health and productivity. Apparently this latest “shiny object” is here to stay. A team at Reviews.com recently tested 67 of the most popular standing desk models and found which ones lead in functionality and were most suitable for a variety of budgets, design aesthetics, and any workspace needs. In addition, they offer some helpful tips when looking for standing desks, outlining the important features, warranty options and how to properly use them. Test the theory. To see if you like standing while you work, use your kitchen counter, your washing machine, or any other surface that’s ergonomically correct for your body. Chances are, you may even have a friend who uses a standing desk; see if you can use it for a couple hours before shelling out a few hundred to invest in your own. To start narrowing the pool, check out max height. Desks should accommodate a wide variety of body types, so make sure they can reach at least 48 inches, with a 20-inch sit-to-stand range, which is ergonomically okay for folks up to about 6 feet 7 inches. Look for great warranties. A standing desk can be a major expense, especially for companies looking to furnish their offices — one desk is typically between $500 and $1,500, but a one-of-a-kind desk from Uplift’s Artisan series is nearly $4,000. So nix any that don’t offer a frame and electronics warranty of at least five years. Make sure the desks are easy to assemble. Factor in shipping: how quickly the desks arrive, and in how many boxes. Also research ease of assembly. 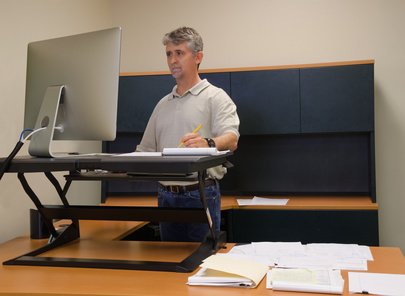 Once you’ve chosen and assembled your standing desk, it’s important you are using it properly. 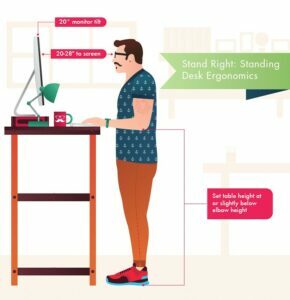 Did you know there is a right way and a wrong way to use a standing desk? Ergonomics are key. The top of your monitor should be at or just below eye level (make sure your head isn’t angled down), and your eyes should be 20 to 28 inches from the screen. Keep your upper arms close to your body, your wrists straight, and your hands at or below wrist level. The table height of a standing desk should be at or slightly below elbow height — basically make a 90-degree angle with your elbow. Your head, neck, and torso should be in line, and your keyboard and mouse should be at the same level. Got that? If not, here’s a graphic that sums it all up, courtesy of CustomMade. If you would like to learn more about which standing desks Reviews.com chose as their top picks check out the rest of their guide here. A recent survey by management software developer AtTask and market research firm Harris Interactive asked 2000 office workers how they spend their time each day. Results showed that 7% of our time at work is spent in wasteful meetings. In fact, 45% of those surveyed feel time spent in wasteful meetings is the largest contributor to lost productivity. Meetings are necessary for communication and collaboration, but how do we ensure that the time spent is not wasted? Before the Meeting: Never schedule a meeting without a thoughtful agenda. In fact, businesses and teams should have an agenda template that is used for all meetings. The template should obviously include logistics like date, start and end time, and location. The agenda should also assign a meeting leader and list others invited. Attendees should include only those that will benefit from or provide value to the meeting. The agenda should state an objective for the meeting to ensure the meeting has a clear purpose and expected outcome. Finally, the agenda should list the topics for presentation, review and/or discussion. Times for each meeting topic should also be determined and shared to allow attendees to prepare based on the amount of time devoted to each. If an attendee needs more time for a certain topic, this can be adjusted prior to the meeting. @JamiePrip suggests limiting the number of items on your agenda to big picture topics for the organization. In addition, he warns meetings that are open ended tend to go longer then they need to. Agenda templates can be built in a document program such as Microsoft Word, in your email/calendar program, or use a pre-built agenda in an application such as Dofor Apple products or cloud-based tools Worklife and Minute. Agendas should be shared with meeting attendees several days prior to the meeting to allow for sufficient preparation (jamieprip.com). 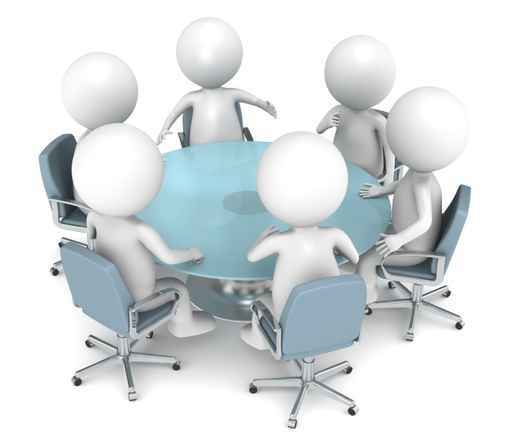 During the Meeting: The meeting leader’s responsibilities are to ensure the meeting starts and ends on time and to keep the meeting on track. If a topic is going longer than planned, table it for a future meeting in order to get through your agenda on time. If a topic is going off-track, pull it back to focus. A timer, such asThe Time Timer, can provide a visual reminder. Have someone assigned to take notes during the meeting, including top points of resolution or non-resolution and any future action items. The applications mentioned above (Do, Worklife and Minute) include features to assign and track tasks resulting from the meeting. Before adjourning, summarize results and next steps. Time for this should be built into the agenda. As an attendee, you may also take notes during the meeting. These notes are likely more personal to your responsibilities and actions. Circle, highlight or star actionable items so that they are easy to pull from your notes after the meeting. After the Meeting: Meeting notes and next actions should be stored in a central location and shared with attendees and others as appropriate. Any “next steps” should be clear and include target dates and names. Individual tasks from the full meeting notes, as well as any highlighted in personal notes, should immediately be added to your project and/or task management system. If you are missing even one of these steps, your meeting can quickly turn from productive to wasteful. A couple months ago, my two daughters and I had the chance to do something I never thought I’d do. Typically, my fear of heights and “mother instinct” would have prevented me and my girls (ages 9 and 12) from experiencing one of the best adventures of our lives. 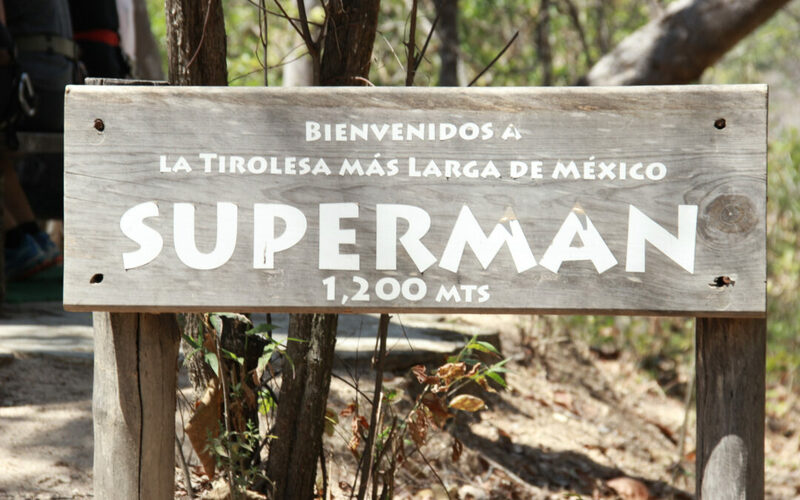 But thanks to Vallarta Adventures, I overcame my fear and accomplished The Superman, the longest and fastest zipline in Mexico. What did Vallarta Adventures do? To answer simply, they started small. After the one hour journey into the jungle, our guides suited us up with our helmets, harnesses and gloves and provided general instructions for the day’s adventures. 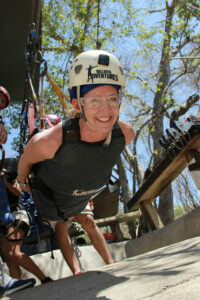 We then headed out for our first zipline. While I was a bit nervous, I also knew that children over the age of 8 were able to partake in this Extreme Adventure experience, so how bad could it be? The first zipline was pretty low-stress for most as we started on a platform overlooking a gradual decline, not a straight drop-off as I had imagined. As the day went on, the ziplines gradually became longer and higher. Additional adventures such as climbing a steep rope wall, repelling from a tree branch, walking a tightrope between two trees, and jumping from a platform attached only to a “bungee swing” provided the group with increased bravery and trust as the day progressed. 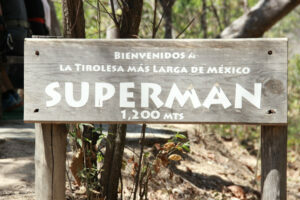 Finally we came upon our last zipline, The Superman. By this time, I had complete trust in our guides, the equipment, and my own judgment that my children and I would be safe. If we would have been asked to do the Superman first, or even earlier in the day, I likely would have told the guides they were crazy. But because they started small and gradually built us up, even though the course was still a little scary, there wasn’t a doubt in my mind that we would all ride the longest and fastest zipline in Mexico. Their process resulted in an end goal that was achievable, low stress and fun. It’s 9:32am, and you are in your office. You just got off the phone with a client and have notes to deal with, you have a staff meeting at 10:00, you have 2 phone messages, the board meeting you are in charge of is in 3 days, your manager asked when the report she is waiting on will be done, and you need to make an appointment to get your oil changed. What do you work on right now? How many times a day do you find yourself in a situation similar to this? Without clear priorities and a defined plan, we often find ourselves doing the wrong things or wasting time that could be spent on productive tasks. Email….Facebook…internet rabbit trails…urgent but low priority tasks…sound familiar? Following are 3 important steps to take to be sure you are making the right choices with your time. Know your values and set clear goals and priorities. It’s that time of year where much of the population is setting New Year’s Resolutions. It is also the perfect time to reevaluate your business and life goals for the year. Without this basis, it is impossible to know whether you’re spending time on the “right” things? Set aside 20-30 minutes with a blank sheet of paper. Divide the paper into 3-5 categories, specific to your life and career, and determine 1-3 annual goals or priorities within each category. Keep this paper handy to refer to weekly, or even daily, as you plan your time. Schedule in weekly planning and daily review. I recommend doing your weekly planning on Sunday evening or Monday morning. 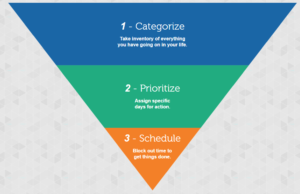 Based on the high-level categories and goals developed above, determine what your priority tasks are for the week. Use this time as a “brain dump” to get everything off your mind on on paper (or in electronic form). Once you have a list of prioritized tasks for the week – that tie to your goals and values – determine where they fit into your calendar. In other words, what day will you work on the task? Is there a deadline you are working towards? Will it require time-blocking in your calendar? 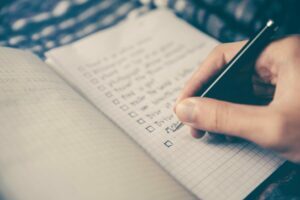 Drilling down to this daily task list will help you to determine if you will be able to reasonably accomplish your tasks within that week. You may decide to push a task into the future based on this. A tool that I like for this step is The Planner Pad, a planner created to work as a funnel for your tasks as described here. At the beginning of each day, take a few moments to review your plan and make any needed changes. Predefined work from your planning time above. In other words, tasks from your Step 2 planning. If you’ve done some time-blocking, you may already have an activity scheduled. Otherwise, take a quick look through your task list for the day and choose the one that makes the most sense at that point in time. 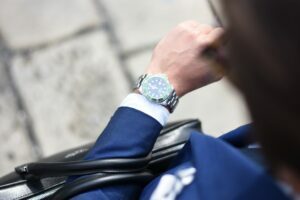 Take into account the length of time you have – will you choose a short task to fill the 15 minutes before a meeting or will you choose a more focus-intensive task with an hour or more of available time. Evaluate your environment. Tasks in a quiet office or other location may differ from those in a noisy coffee shop. Work as it shows up. Any new work that shows up should be evaluated for priority and placed into your system as appropropriate. Defining/processing work. This includes managing email, returning phone calls, filing or scanning, and your weekly and daily planning. It is important to schedule time in your day for these tasks. 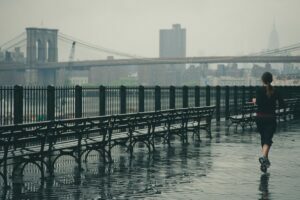 When making the decision as to what to work on at any given point in time, a question you can ask is,” What will give me the highest payoff?” Sometimes it comes down to intuition based on the work and planning done in the three steps above. As an example, I knew via my weekly planning that I had a goal to work on my newsletter today. When I came to a time in my day in which I had one hour, in a quiet location, I decided to use that time to focus on writing this article. Life Made Simple on Do Standing Desks Really Increase Productivity? Ellen Delap on Do Standing Desks Really Increase Productivity?